I am primarily a painter who paints onto the traditional support of linen stretched onto a wooden frame. I also make drawings and incorporate print-making procedures like screen-printing into my paintings. However, I really enjoy ‘going off-piste’ when an opportunity arises to expand my usual practice by painting onto objects instead and developing unusual installations for my work. Drawing and painting has been something I have enjoyed doing since I was a child. During my twenties, I did as many courses at TAFE or CIT as I could to develop my skills and began making more and more paintings. I was looking at paintings during a visit to the National Gallery and I was very aware in the gap between what I was doing at that stage and the works on the wall of the NGA. I decided then that I wanted to make paintings that could ‘move me’ like many of the paintings I was looking at. Determined to learn how to make work that could communicate aesthetically motivated me to commit fully to an art practice and I began full-time study at the ANU School of Art, completing a Bachelor of Visual Art in 2003. For me this was a great choice, studying there opened a door to a big, bright world of ideas that gave me a context for my work and a network of peers. Fundamentally I explore the sense of wonder that can be experienced when you look and think about animals, birds and plants. Wonder being a sensation experienced when you encounter something new – or perceive something familiar to you in a different way. Experiencing wonder lets me ‘see’ how odd, bizarre, beautiful or even repulsive these living creatures are. I try to convey this in my paintings so others may have the pleasure of seeing or considering them differently too. Using painting to offer a fresh look at animals and plants allows me explore other ideas too. These include how our ideas about animals impacts on our own sense of what it is to be human and how the presence of native animals and plants is fundamental to our experience of ‘place’ and even national identity. I have been concentrating lately on conveying how the existence of plants, birds and animals endemic to Tasmania impacts greatly on the unique sense of place experienced in this location. Studying the historical illustrations and prints made during European voyages to Australia and the Pacific in the 18th and 19th centuries has been a big influence on my art making. The artists who made these images were seeing Australian plants and animals for the first time. They were amazed by what they saw and their images convey the wonder they felt. Their strange and often awkward images give me clues on how I can make paintings to do the same thing. Tricky question! Every time I realise a solo exhibition after months of quietly working in my studio I am excited to see the works installed on the gallery wall. This is always the first time I get to see all the work together after imagining it for so long. What has given me the biggest buzz so far though must be a couple of years ago when I worked on the Enlighten Canberra festival. I designed several projections that incorporated paintings I had done. It was amazing to see them projected onto the National Library and the National Portrait gallery walls. I am still fascinated by the ideas I have been working on. The historical images available in archives for me to study are a rich treasure trove that I will be immersing myself in for a while. Excitingly, I’m off to Paris in October to undertake a three-month residency at the Cité Internationale after being awarded a residency with the Institut Français. I will be making work about the exchange of plants between Tasmania and the garden of the Empress Josephine at Malmaison around the beginning of the 19th century. Maybe this sounds dry but it opens up a dialogue with the concepts of the Enlightenment, colonialisation and the development of the natural sciences, concepts that I will try to convey in my paintings with lots of delicious, French decorative imagery. Mostly, I think the Canberra art scene is fantastic, populated with a supportive, varied bunch of artists with a range of opportunities on offer. The main thing that I would like to change would be to increase Government and public recognition of the value and richness of the local art scene to the quality of their lives. My next exhibition is called Voyagers’ Tales: Labillardiere and it will be at Beaver Galleries, Deakin starting Thursday August 10 and running until Sunday August 27. The paintings are the result of period of fieldwork in south eastern Tasmania supported by ArtsACT project funding. 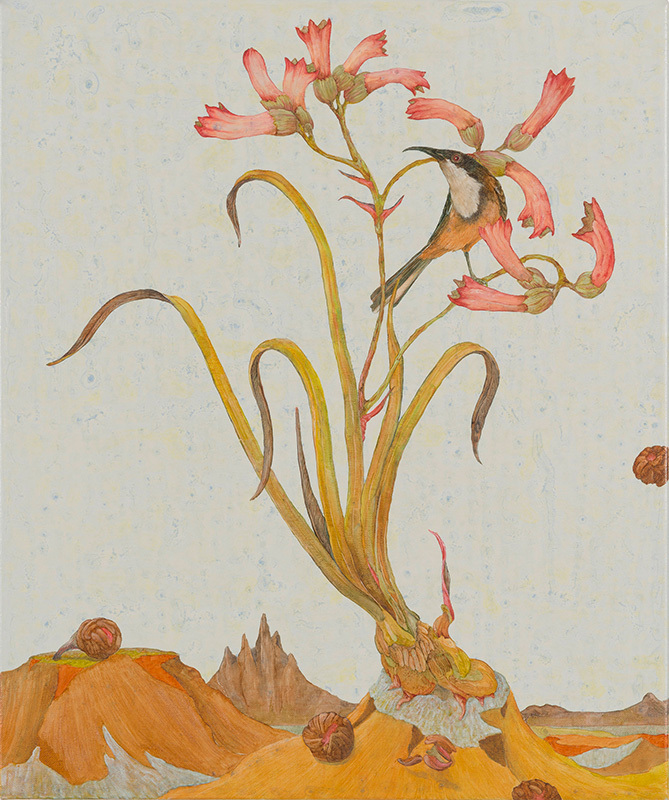 Nicola Dickson is represented by Beaver Galleries, Canberra. For all enquiries, please contact the gallery on 02 62825294 or via email at mail@beavergalleries.com.au.